We’re floating through space this week, providing humor and color to an otherwise black abyss with a Chamomile Citrus tea from Mighty Leaf, which you can purchase from select boutiques or online. The crews from Tin and Kaptara have taken giant leaps for mankind into the unknown, and the soft citrus flavor of this week’s tea will help you stay in stasis with them. If you haven’t had an herbal tea before, keep in mind that they have no caffeine. You should also continue to use boiling water for herbal teas, though they should be steeped for less time than black teas, usually about three minutes should do. Section of a panel from Tin #1. 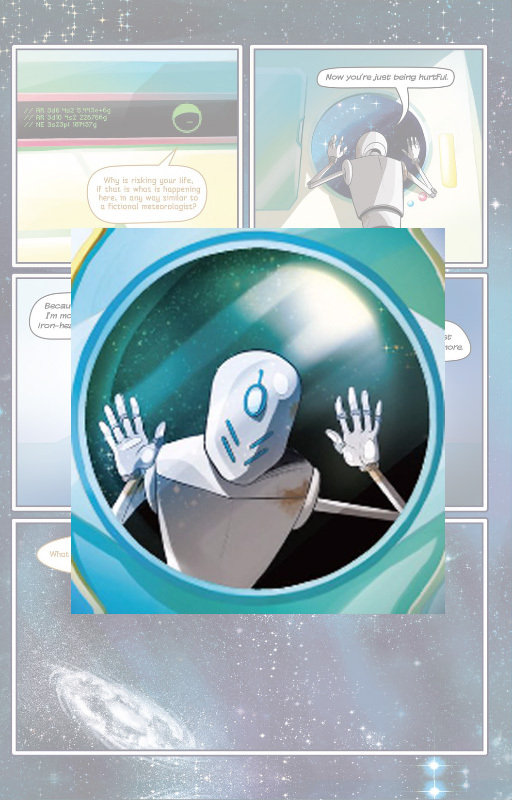 Tin #1 written by Ilya Dvilyanski, translated by Mattia Bulgarelli and illustrated by Manuela Soriani begins the story of Rob and A.L.I.C.E., two artificially intelligent, sentient beings — one android and one ship system, respectively — navigating and recording galaxy for the humans that sent them there. This book is largely introductory. It sets up the two as a duo, with Rob considering himself to be the Indiana Jones of deep space and A.L.I.C.E. adding a solid shot of sarcasm and reality to his spark of wanderlust. They have a good, natural banter that feels strikingly human. There’s also a strong, impending sense of adventure, despite most of the book being dialogue. Though they’re in the middle of space — where no one can hear you scream — Rob is optimistic about finding something among the stars. There’s hope that maybe all of his traveling has been for something more, that he hasn’t been rusting inside of A.L.IC.E.’s system for nothing. The book is part of the comiXology Submit feature, which it started shortly after being acquired by Amazon. 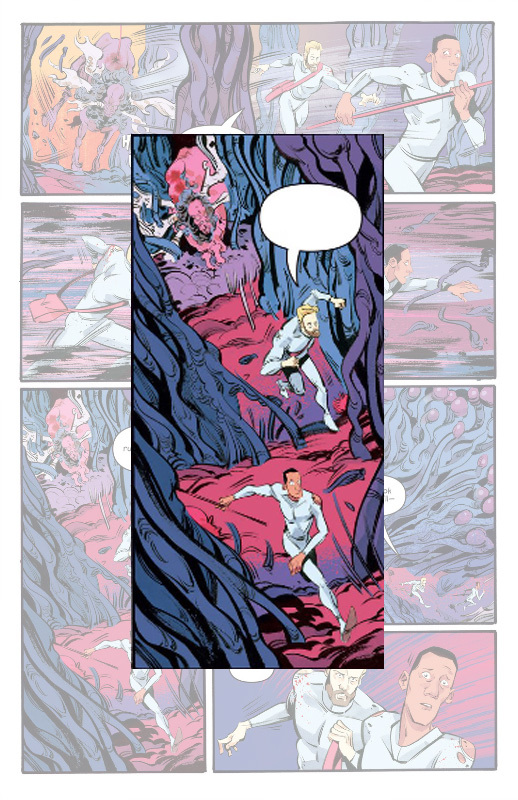 The program allows indie comic creators to self publish on a widespread platform. There’s already a widespread array of works being updated consistently. Section of a panel from Kaptara #1. Kaptara #1 written by Chip Zdarsky and illustrated by Kagan McLeod opens the story of Keith Kanga and his fellow crew-mates’ expedition to Mars in hopes of settling it. Unfortunately, their ship moves too close to an inter-dimensional portal that pulls them through, forcing them to crash land on the strange and dangerous planet of Kaptara. The crew will have to fight long enough to reach civilization, and when they find it the crew will learn that Earth may be in grave danger. The crew is diverse and dynamic, with each having a strong expertise in one science or another. Like Tin, the story boasts a great sense of humor and bright color palette that’s striking against the deep void of space. The book keeps the seriousness of the situation intact while giving the reader a fun — though terribly dangerous — experience on a far-off world. The soft floral tones of this week’s tea will help reconnect our space travelers to their home worlds. It also will help keep you in the same easy, floating state that both of our stories begin with. Meanwhile, the tea’s color will reflect the surprisingly bright colors found in this week’s books that stand stark against space.